Social media marketing (SMM) "the big thing," a powerful marketing tool of communication to interact with other people by sharing information with them and receiving information from them. Social media is a term we throw a lot these days, often to describe what we post on social media channels like Facebook, LinkedIn, Twitter, Instagram and others. The goal is to produce content and engage audience to help a company of individual increase brand exposure and broaden customer reach. SMM can enable small and big business looking to further their reach to more customers and audience. Customers are interacting with brands through social media channels, therefore, having a strong social media presence and marketing plan is the key to understand their interest and achieve your marketing communication and branding goals. Social media marketing covers activities involving social sharing of unique and quality content, videos, and images for marketing purposes which helps a company get direct feedback from potential customers. The interactive parts of social media give customers the opportunity to share their views, ask questions or voice complaints and feel they are being heard. Create your presence by listening More! Success with social media requires more listening then talking. Read your target audience’s content and join discussions to understand and learn what’s important to them. Only than you can create quality content and spark conversations that add value. It’s better to specialize than to be a jack of all trades. 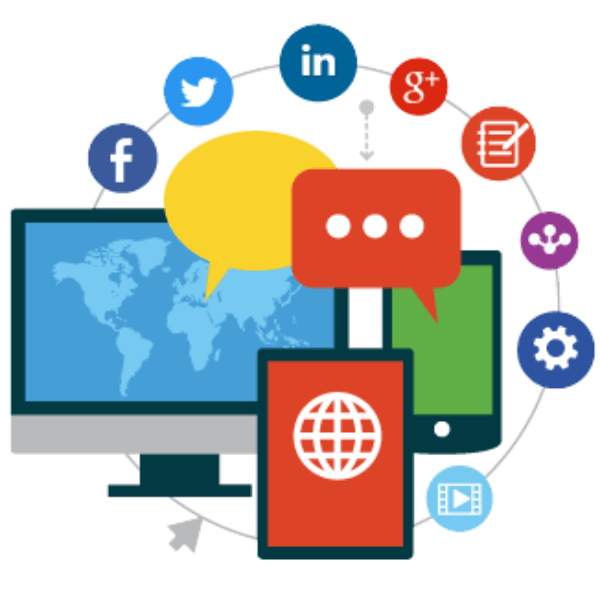 At MOZWEBMEDIA we aim to prepare highly-focused social media marketing strategy intended to create a strong brand presence has a better chance for success. Creating Unique Presence Online comes with Patience. Quality is more important than quantity. 100 online connections who read, share and talk about your content is better than having 1,000 connections who never come back after connecting with you the first time. Social media marketing success doesn’t happen overnight. Content sharing, reaching your target audience and creating your online presence takes time. You’ll need to commit to the long run to achieve desire results. Different Entry Points to Reach Out. If you publish quality content and work to create your online audience of quality followers, they’ll share it on Twitter, Facebook, LinkedIn, their own blogs and more with their own audiences. This sharing opens new entry points for search engines like Google, Yahoo & Bing to find it in keyword searches. MOZWEBMEDIA creates those entry points that could grow to thousands of more potential ways for people to find you online. Be Interesting enough to influence Audience. Spend more time in finding the online influencers in your market who is having quality audiences and are most likely to be interested in your services, products and business. MOZWEBMEDIA connects you with those audience and build relationships with them. If you get on their radar as interesting and useful source of information, they might your content with their followers. We put your business and create your presence in front of a huge new audience. Focus Less On Conversions. MOZWEBMEDIA Adds value to the conversation. If you are spending most of your time on the social Web directly promoting your services and products, people will stop listening. Focus less on conversions and more on creating unique and amazing content and work on developing relationships with online influencers. In time, those people will become a powerful tool for word-of-mouth marketing for your business. Regard the Audience. When someone reaches out to you in person you don’t ignore them so don’t ignore them online audience. One of the most important reason to work with MOZWEBWEDIA is that we build your social media marketing success by building relationships, so always acknowledge your audience who reaches out to you. Be Available to your Audience. Don’t disappear after you publish your content. Be available to your audience. That means you need to regularly publish quality content and participate in conversations. Online followers won’t hesitate to replace you if you don’t reply and disappear. At MOZWEBMEDIA You don’t have to worry about that. Take Out Time To Participate. you can’t expect others to talk about you and share your content if you don’t do the same for them. So, a portion of the time you spend on social media marketing should be focused on participating and talking about content published by others. Social Media gives you a lot of opportunity to increase your visibility. All your networks are your channels for you to publicize your voice & content. Making your brand more familiar and recognizable makes your business more accessible to your customers. Only when brands who engage on social media channels enjoy higher loyalty from their customers. A comprehensive and open social media plan could prove significant in making consumers into being brand loyal. Place where Brands can act like people. Wondering why we said that? Because here people love to do business with people rather than companies. Social Media Marketing will always result in higher conversions. The Logic is very simple as you have higher no of social followers it builds up trust & credibility which builds up your audience and increases your existing traffic. Social media is a place where brands can act like people do, and this is important because people like doing business with other people; not with companies thus making Social media marketing results in higher conversion rates in a few distinct ways. It very simple as a higher number of social media followers tends to improve trust and credibility in your brand, representing social proof. As such, simply building your audience in social media can improve conversion rates on your existing traffic. Answer this easy question. How many times have you posted a compliment or wrote a feedback on Social Media about the product or service you’ve used lately? Taking our time to Interact with your customers regularly is a show of good faith. The more people that are talking about you on social media, the more valuable and authoritative your brand will be perceived by the new users. Inbound traffic can be easily increased via social media marketing. The more quality content you post, more the inbound traffic is generated. To Decrease your Marketing Costs. Putting in one hour a day to develop your content and strategy, you could start seeing the results of your efforts. Even paid advertising through Facebook and Twitter is relatively cheap (depending on your goals, of course). SEO is the best way to capture relevant traffic from search engines, but the requirements for success are always changing. Google and other search engines use social media presence as a significant factor for ranking websites and brands accordingly, because of the fact that strong brands always use social media. Thus, being active on social media could act as a “brand signal” to search engines that your brand is legitimate, credible, and trustworthy. Social media, at its core, is a powerful communication channel than an email or phone calls. Every customer interaction you have on social media is an opportunity to publicly demonstrate your customer service level and second enrich your relationship with your customers. Social media also gives you an opportunity to gain insights about what your customers are interested in and how they behave. For example, you can monitor user comments to see what people think of your business directly.